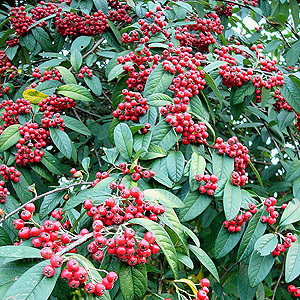 With a canopy laden with rich, red clusters of berries, this tree gives the garden a welcome flush of colour. As the name suggests, it thrives in cold climates, specifically the mountains of the Himalayas where the people use the branches for basketry and making bridges. Its wonderful large inflorescences of creamy white flowers in the summer attract lots of pollinating insects, so it is a useful plant to have in the garden in a shrub border, woodland garden or as a lovely hedge. The bright red berries are a great source of food for birds in the winter, when food is scarce. They can tolerate air pollution, deep shade and dry conditions, what a terrific plant!